Whether it's the view from the summit or from the tower--or the experiences enroute--"fire tower fever" grips you right away and there's no turning back. Sound familiar? Then you're a person for whom the Glens Falls-Saratoga Chapter of the Adirondack Mountain Club (ADK) has created the Fire Tower Challenge. Consider the spectacular views of the surrounding hills and valleys. Consider the wildlife you may see along the way and the botanically interesting vegetation on the summits. And consider that for some 50 - 70 years the cabs atop these towers were the outlooks of "fire spotters," observers whose lonesome vigil was broken only occasionally by visits from the public. The Fire Tower Challenge begins with the publication of the guidebook, 'Views from on High: Fire Tower Trails in the Adirondacks and Catskills' by John P. (Jack) Freeman. The Challenge hikes are described in detail, along with a fascinating essay describing the history of Forest Preserve fire towers by noted historic preservationist Wesley H. Haynes. The book is published by the ADK. To buy Views from on High call 1-800-395-8080 (8:30 AM to 5:00 PM, Mon through Sat. ), visit our Lake George or Heart Lake facilities or purchase online from the ADK Mountain Club Online Store, It is also available from bookstores and outdoor retailers. You don't need to be a member of ADK to take part in the Challenge. Since 2010 the Glens Fall-Saratoga Chapter of the Adirondack Mountain Club offers a new Fire Tower Challenge: the Winter Fire Tower Challenge. Climb 18 of the Adirondack mountains with fire towers and all five in the Catskills between December 21 and March 21 and you can earn a rocker for your Fire Tower Challenge patch. You can keep track of your climbs on the regular brochure, noting at the top of the form that it's the Winter Challenge. Please note that like the regular Fire Tower Challenge, it is not necessary to climb the actual towers. In fact, it is inadvisable to climb an icy fire tower. Some trailhead parking areas might not be plowed in winter presenting access challenges. Winter hiking while exciting can be more strenuous especially if the trail has not been previously tracked-out and there are less daylight hours with shorter periods of twilight. Due to Gore Mountain not allowing uphill travel during ski season the ADK Fire Tower Challenge committee has decided to remove Gore from the tower list during the winter ski season. Dates will vary depending on the opening and closing of the ski season. This is being done for obvious safety reasons. 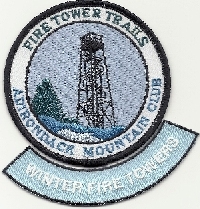 To complete the Challenge and receive the official full-color patch, hikers must climb and document, by date, ascents of at least 23 fire tower summits: 18 of 23 Adirondack Park summits and all 5 Catskill Park summits. Climbing each tower itself is not required, nor in fact recommended, for those towers that have not been restored for safe public use. When registering the dates of your climb, be sure to use extra sheets of paper to describe details of interest: weather, wildlife sightings, your impressions, your companions - and whatever else caught your attention. We really want you to share your experiences with us, so please be expressive. It may take 4 to 6 weeks before your check is cashed and your patches are mailed! Adobe Reader needed to view/print Brochure. 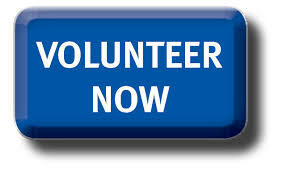 Click on the above button to become a chapter volunteer!